Ardbeg Whisky from the small Scottish island of Islay is one of the most recognised and respected whiskies in the world. 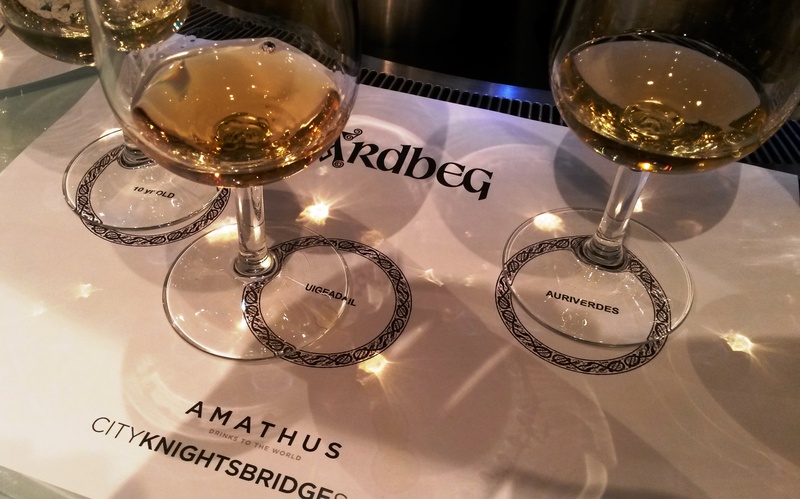 So when Amathus Knightsbridge had the chance to host a master class of Ardbeg’s most recent limited edition, Auriverdes, it was a hand we simply had to bite off. We were joined for the evening by Eduardo Vivas, Ardbeg’s brand representative, to talk us through what we were tasting. 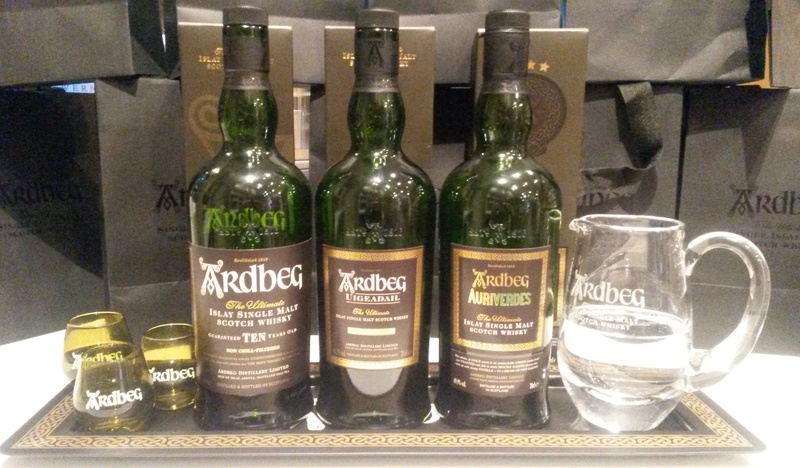 Every year Ardbeg release a special edition whisky, each with their own story and character. We started the evening with Ardbeg’s classic 10 year Old before moving on to last year’s limited release, Uigeadail, followed by, of course, the Auriverdes. The whiskies were all tasted neat, with a dash of water and also with a morsel of cheese and the changes on the palate were fascinating. My tasting notes from the evening will follow but first, here’s a brief breakdown of Islay whisky. Southern Islay Whiskies, and Ardbeg particularly, are known for having a distinctive peaty character. Most of Islay is made up of peat, layer upon layer of spagnum mosses and vegetation that have rotted and condensed over the centuries. The salty sea breeze adds even more flavour by blowing salt onto the peat bogs which then dry, retaining the sea salt. The briny peat is burnt to malt the barley which is subsequently distilled. Combine this with water which also has a peaty quality and the resulting whisky is, not surprisingly, very characteristic of the area. 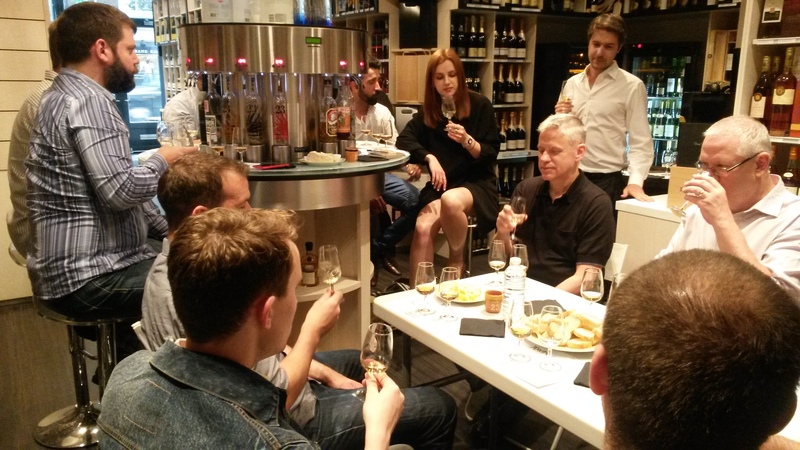 So, what did we think of the whiskies? Revered around the world as the peatiest whisky of them all, the 10 year old is retains complexity and refinement. It does not flaunt its peat, rather gives a backbone to the other characters of malt, sweetness, and freshness. The first aroma is that of smoke and spice but as the whisky opens up in the glass these give way to freshly cut grass, antiseptic, smoky bacon and vanilla. With a dash of water more citrus notes become obvious and with Montgomery Cheddar the whole mouthfeel softens out and reveals more stone fruit flavours and mellow smoothness. Uigeadail is the name of the Loch that feeds the Ardbeg distillery with its peat laden water. The barrels used to age this edition are old Olorosso Sherry casks which give the finished product a distinctive richness. Notes that we found ranged from sweet honey, butterscotch and Christmas cake to savoury salted almonds, toasted hazelnuts and BBQ spare ribs. With water added the freshness of the whisky came out more and when paired with 24 month matured Parmegiano Reggiano we discovered more floral and grassy notes. Produced with the Brazil Football World Cup in mind this expression of Ardbeg is a dram of two halves, just like the beautiful game itself. Auri is Latin for gold, describing the colour of the whisky and Verdes is Latin for green, representing the bottle. It’s no coincidence that these also happen to be the colours of Brazil either. The barrels used to mature the Auriverdes are old Bourbon casks and only the ends of the barrels are toasted, burnt. This gives the whiskey a complex balance of light lifted notes combined with deeper, savoury, toasty notes. This expression has a distinct salty character making it a really savoury dram. Think smoked fish smothered in butter. With water added the whisky becomes even more complex (‘how is that possible?’ I hear you ask) showing notes of bonfire, burning forest floor and a softer, more floral element. The cheese pairing for the Auriverdes was an amazingly creamy, rich Tunworth soft cheese. Now the whole mouthful with cheese and whisky is divine, all the flavours mentionted above seem to combine and acquiesce into one effortlessly rounded, complex, exquisite mouthful. Interested in what you’ve read? Come and join us at an upcoming master class soon. Find out more by following the link. Next > Arriba Arriba, it’s time for Tequila!